This time of year we pause to reflect on our blessings. We get to work for and alongside some of the brightest and most inspiring people of any industry. Helping others find compassionate care and engaged living is eternally fulfilling. Listening to older adults share their life stories and understanding the importance of one’s own legacy is powerfully moving. We love being on the leading edge of a digital revolution, with the opportunity to communicate with older adults in new and exciting ways. We have a front-row seat in the senior living classroom where we are each learning new ways to live a more fulfilling life. The gratitude, grace and appreciation older adults exhibit for how we listen, guide, counsel and care for their well-being is inspirational. The benefit of life lessons gained from the knowledge and experience that seniors share with us. We’re at the forefront of tectonic (and exciting!) shifts in the way we view retirement living. We’re here to witness the coming of age of boomers and their impact and influence on everything from architecture, to lifestyle and to advertising in senior living. The work is demanding, challenging and often exhausting but knowing that our efforts add a value to our clients, community partners, residents and future residents is priceless and beyond measure. 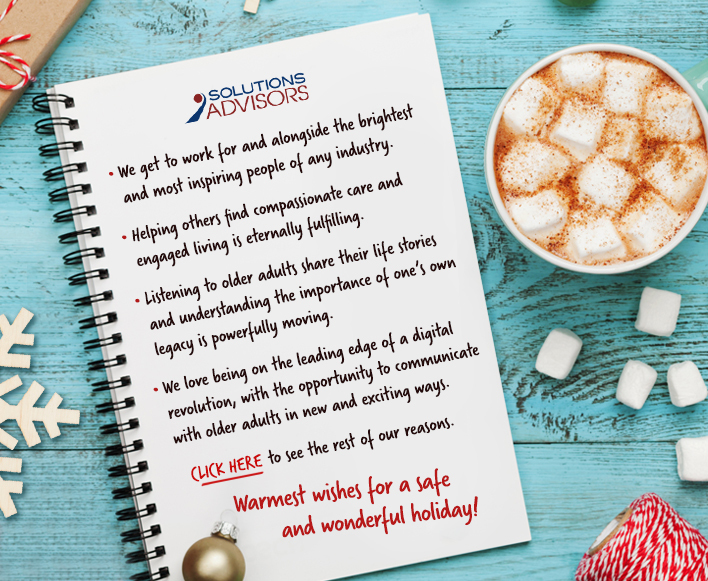 Being leaders in an industry that has shifted from a care focus to a supportive successful aging focus. To see innovative changes in care-focused initiatives and intergenerational movements. The ability to witness a shift away from ageism and towards embracement of the many great facets of aging. Knowing we can positively influence a person’s life trajectory leaves you feeling pretty good at the end of the day.